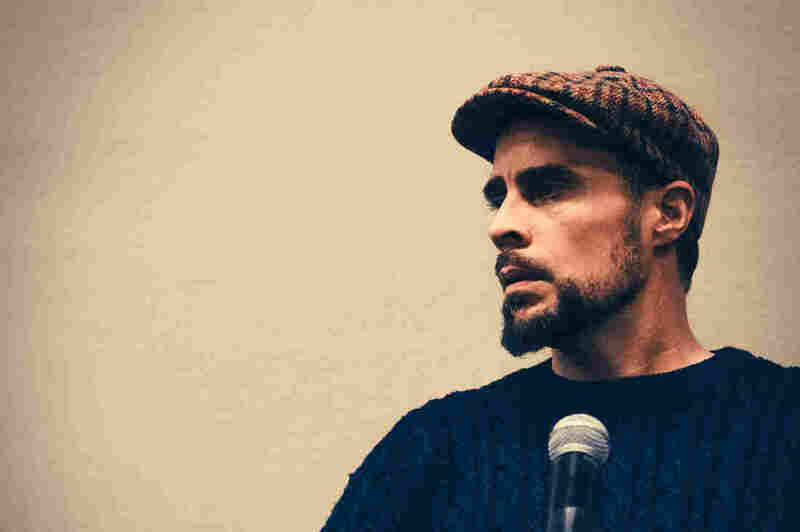 An American Muslim Preacher Faces His Own Mortality Usama Canon is the founding director of the Ta'leef Collective, a "third place" for Muslims between mosque and home. After an ALS disagnosis, he's reflecting on his work. Usama Canon, a Muslim preacher and the founding director of the Ta'leef Collective. On a recent night in Chicago, a Muslim preacher sits on the floor in the center of an ethnically mixed and mostly young group of men and women. Around him, a drum circle sings praises of the Islamic prophet, Muhammad. Mint tea is served on gold trays. A man with a hipster beard circulates an incense burner. A musky, wood scent fills the air. And Usama Canon begins to teach. "If you find yourself religious but your religiosity has led you to be unkind or to be less then loving or less then patient, then you're doing something wrong," he says. Canon, 40, gives off a laid-back, West Coast vibe. He wears a beanie and prayer beads wrapped around his right wrist like a thick bracelet. He is the founding director of this place, the Ta'leef Collective, with campuses in Fremont, Ca. and Chicago. In Arabic the name means "the coming together of many things." The Ta'leef Collective was envisioned as a "third place" between the mosque and home to provide Muslims, especially young or new Muslims, a space to explore their faith outside the confines of the traditional mosque. The nonprofit is part lecture hall, part gathering space, and part sanctuary. 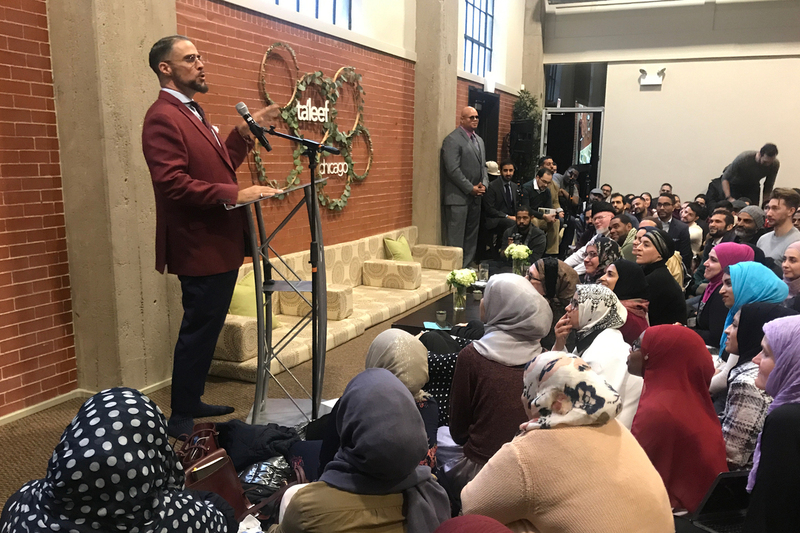 Participants ranging from former inmates to searching youths say Usama Canon's teachings have helped them understand Islam in their everyday lives. Those lessons feel essential to his students at a time of growing hostility toward the religion, which has more than 3.45 million U.S. adherents. So when Canon was diagnosed with the degenerative neurological disease ALS in the fall of 2017, the news devastated Muslim communities all over the world, which hold Canon up as a pioneer. They call him Ustadh, "Teacher" in Arabic. He was diagnosed after noticing a change in his singing voice, when reciting Quran or singing hymns. It was deeper, slurred. His first thoughts went to his five children, who range in age from toddler to teenager, and his wife. He may never see his kids marry. Most people with ALS, often called Lou Gehrig's Disease, survive between three and five years after their diagnosis. And then he watched his friends and students digest the news. "It was almost like being a ghost in the room," he says. "I felt like saying, 'Hey I'm not dead yet, dude. I'm right here. Why are we pre-mourning?' "
In one of his last talks before taking a leave of absence, Usama Canon addresses a crowd at Ta'leef Chicago's campus. Canon is the California-born son of a black Baptist father and a white Christian mother. He became Muslim in 1996, just after graduating high school, embracing the faith through his love of hip-hop and a pursuit of social justice. He served as a Muslim chaplain in the California prison system, and calls the prisoners he worked with there some of his greatest teachers. He is also the spiritual leader for the Inner-City Muslim Action Network, which works with at-risk youth, provides medical care and helps former inmates on the South Side of Chicago. But Ta'leef is what made Canon into a global figure. Thanks to his online talks, he has accumulated thousands of admirers in Muslim communities from northern California to Jakarta, Indonesia. "It's rooted in the idea that Islam is not a foreign thing and Islam is not suspect and Islam is not malignant," Canon says. "Granted, there is all this insanity in the world and there are Muslims doing insane things, but the core of the religion is a beautiful, beautiful thing." Canon studied Islam at the Zaytuna Institute (now Zaytuna College) in the San Francisco Bay Area before traveling to Africa and the Middle East to study with Islamic scholars and learn Arabic. Soon after the Sept. 11, 2001 terrorist attacks, his teachers at Zaytuna convinced him to start a youth outreach program. In 2009, Ta'leef became an accredited nonprofit in Fremont, Ca., and in 2016, it expanded to Chicago. "Ta'leef was born and I just did what I knew how to do, which is feed people and talk to them and hang out with them and hold them in a nonjudgmental way," he says. The organization filled a void in Muslim communities at a time people were dealing with a growing suspicion and anger toward the faith. More than half of U.S. Muslims came of age after Sept. 11, and Canon has helped those young people work through their questions of identity as the faith saw increased political scrutiny. He is unique in the Muslim American landscape, says Zareena Grewal. She teaches religious studies at Yale University and has written extensively on U.S. Muslims. "He understands there is a need for affirmation; Muslims feel really lonely," Grewal says. "And the pressures on the community manifest in Muslim infighting or feeling judged." Canon is part of a small cohort of American Muslim leaders creating these types of spaces for one of the most diverse faith groups in the country, she says. And he's been successful where many others have failed, creating an unreservedly welcoming place especially for young or new Muslims who feel judged by non-Muslims as a threat and then judged inside their own community about whether they're "Muslim enough." On top of all that, Canon makes Islam look cool, Grewal says, in the way he dresses: bow ties, pocket squares, lush fabrics. In the way he speaks, slipping from references to hip-hop to personal stories to quotes from the Quran. "He's really modeling an expansive vision of what it means to be an ethical Muslim and to prove your piety. You don't need to don your turban and bow your head and be quiet," she says. "You can have a little swag, you can be a presence in the room, as he certainly is." And for many of his fans, Canon is a beacon at times of struggle. Fatima Saleck met Canon last year at a moment she was questioning her faith. The 24-year-old was part of a Ta'leef mentorship program, selected because of her outreach to converts to Islam in her hometown of Houston. Muslim extremists committing acts of violence left her angry and confused. Hypocrisy in her own community didn't help. Why was it happening? "I just was like, so, obviously I don't need to be a Muslim. If these things exist, then that's something I don't want to be a part of," she says. Canon helped restore her faith. "He told me, 'We're human beings, human beings have the capability of entirely good or entirely evil and most of us are just in between,' " she says. "It was a distancing of their personalities from mine, we were not sharing a collective belief system. Their actions never had an effect on mine, never had a bearing on me, just like mine never had a bearing on theirs." His perspective gave her comfort. "I told him things that I hadn't even told my own mother, the connection he gave us as a person or even as a whole was so authentic." She adds, "There is no façade behind it, there was no 'Oh, I'm a teacher and I've studied overseas.' It was just, 'Hey my name is Usama and I understand what you're talking about.' "
That authenticity is his greatest appeal, Canon's admirers say. It's also part of the reason his diagnosis has been so devastating to them. Acclaimed Muslim hip-hop artist Brother Ali says Canon taught him there isn't just one way to be a good Muslim. There was a time the rapper — a legally blind, white, albino from Minneapolis who found acceptance in hip-hop and Islam — was considering abandoning his career and studying his faith full time.
" 'Who's going to serve your fans while you're gone? Only you can do that,' " Brother Ali recalls Canon telling him. "He made me understand what my role is." That message inspired his most recent album All the Beauty in This Whole Life. One of the songs, "Uncle Usi Taught Me," is named for Usama Canon. "Uncle Usi taught me/ can't teach what you don't know/ you can't lead where you don't go," he writes. But Canon's disease, ALS, will eventually steal the voice he uses to teach and paralyze his body. With a time limit on his life, he thinks about the things that drive his faith and work: orphans, the homeless, a prison system he sees as broken. "Let's be honest, when we do this thing called community we put our own twist on it. And the twist I put on it is a northern Californian, mixed kid who comes from a hip-hop, reggae, hacky-sacking, boogie-boarding background," Canon says. People joke that his is a "California Islam." "Hey, bro, call it what you want to, and if that's what Cali Islam is then we accept," he says. "Welcome people, smile at people, make sure that they're taken care of as a priority." When he first became Muslim there was no space where he could have brought his mother to be part of his conversion process. Today, he says, that place exists. "Ta'leef is a space where when people are coming to embrace Islam. They bring their mom who is not coming to embrace Islam," he says. "We'll give her flowers and a chair and make sure she's part of the process." That's the very simple, very basic concept of what he teaches: to value people; to welcome people; to help people. Now, Canon is taking a yearlong leave of absence from Ta'leef to deal with his disease and spend time with his family. He reflects on what he's created and whether it will outlive him. "It's only as lasting as the women and men that have hopefully benefited and learned," he says. "Anyone in the audience that believes that Usama has had a significant impact in their life, please stand."